Simply stated, Random Access Memory is a name applied to microchips designed to store and address information while a computer is actually using it. This is in contrast with the hard drive, which stores and accesses information semi-permanently (that is, until it is deleted). Choosing the right amount of the right kind of RAM is crucial to the success of your homebuilt computer project. 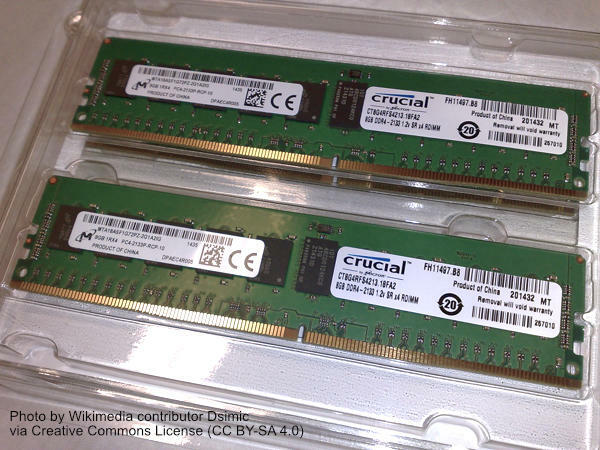 Professionals refer to individual RAM modules as "sticks." So should you, if you want to be taken seriously at your local computer store or geek hangout. RAM is volatile, which means that it needs a constant current in order for it to retain information. Once the current is removed, the information disappears. This is why you have to save a document that you're working on before you shut off your computer. When you hit "save," the document is transferred from the RAM (temporary storage), to permanent storage (hard drive, floppy disk, CD-RW, etc.). This is also one reason why it's important to save long documents periodically while you're working on them. If your computer experiences even a brief power interruption, all of the information stored in RAM will be lost. SRAM. Static Random Access Memory is very fast and very expensive. It is primarily used for memory caching (such as on processor chips). Architecturally, it has multiple transistors for each memory cell. It does not need to be refreshed. It is rarely encountered except as a component of other devices. DRAM. Dynamic Random Access Memory is slower than SRAM and needs to be refreshed many times every second. Each memory cell consists of a capacitor and a transistor. DRAM is much less expensive than SRAM. SDRAM. Synchronous Dynamic Random Access Memory is a special type of DRAM that is synchronized to the system clock. Each chip contains internal registers that accept requests from the CPU, thus freeing the CPU to do other things while the data is assembled. Since SDRAM is synchronized to the CPU, it "knows" when the next cycle is coming, and has the data ready when the CPU requests it. This increases efficiency by reducing CPU wait states. DDR-SDRAM. Double-Data Rate SDRAM works the same way as does ordinary SDRAM, except it works twice as quickly by synchronizing to both the rising and falling of the clock pulse (which makes it twice as fast as ordinary SDRAM). DDR-SDRAM can also be installed in dual-channels if the motherboard supports this arrangement. There is no difference in the actual RAM modules used for dual-channel DDR, but the two sticks of RAM in each channel must be a matched pair (same size and speed). Click here to go to the next page where we'll talk about choosing RAM.